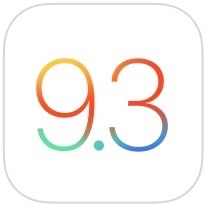 Apple today released the second beta of an upcoming iOS 9.3 update for public beta testers, just a few days after seeding the second iOS 9.3 beta to developers. iOS 9.3's second public beta comes a week after Apple released iOS 9.2.1, a minor update, to the public. Beta testers who have signed up for Apple's beta testing program will receive the second iOS 9.3 update over-the-air after installing the proper certificate on their iOS device. The update also includes new 3D Touch Quick Actions for stock apps like Weather, Settings, Compass, Health, App Store, and iTunes Store, plus it introduces password protection for individual notes in the Notes app. News in iOS 9.3 includes in-line video playback, landscape mode on the iPhone, and more personalization, while the Health app introduces a new Apple Watch-style "Activity" interface. Today's second beta includes support for a Night Shift toggle in the Control Center on iOS devices. Night Shift is denoted by a new eye-shaped icon in between the icons for the timer and the calculator on the iPhone. Tapping on the icon brings up options to turn the feature on or disable it until the next day. Mark Gurman claims this was in internal 9.3 testing at Apple so I wouldn't be surprised if we see it in iOS 10. Flashlight isn't an app either? It's a toggle, isn't it? Just give me low battery mode on the panel. ahhh. It makes absolutely no sense to have a control center toggle for a function whose tent pole feature is that it turns itself on and off automatically. I sure hope iOS 10 brings us some ability to customize the UI because Apple's sensibilities are increasingly different from my own. Not sure where I would go if I ditched iOS, but I'm activity looking at alternatives for the first time since the original iPhone came out. They need to 3D touch the top bar instead of all the icons. 3D touch the battery and see %, 3D touch bluetooth to see what devices are connected, 3D touch your carrier name to see menu to switch to airplane mode or LTE from 4G quickly. Super super easy to add into the device, instead of having to go to the home screen all the time to 3D touch an icon. I'm so confused right now...my phone is on 9.3 Beta 1 and it says it is up to date. Why in the hell? Power down your device, turn back on and check again.. usually that brings up the update from the server. Bluetooth is back to functioning normally. Thankfully!